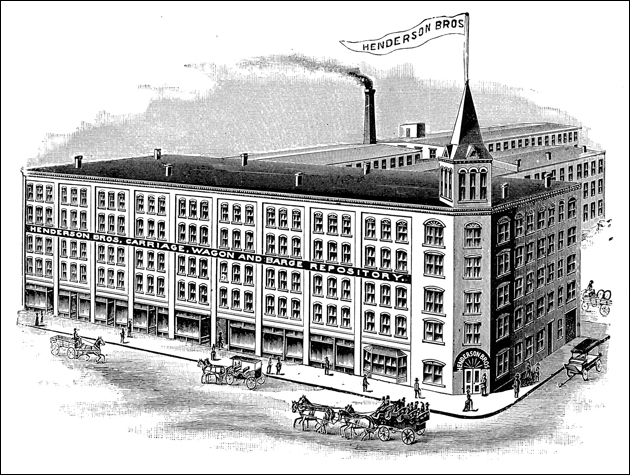 The Henderson Brothers Company was founded in 1856 by John J. Henderson and Robert Henderson. The brothers, who situated the firm in North Cambridge, were the first to establish a carriage repository outside of the City of Boston. During the era of horse-drawn vehicles, the company primarily manufactured carriages and carriage parts. It was nationally known not only for its brakes, drags, barges, and wagons, but also for its mail carriages, passenger carriages, sleighs, and caravans. In 1892, the original Henderson Brothers factory – which was a significant landmark in North Cambridge – was completely destroyed in a large fire. A new factory was quickly rebuilt at 2067 Massachusetts Avenue on a larger scale and out of more modern materials (Stone, 1930; Gilman, 1896). In fact, as one contemporaneous newspaper described, the rebuilt works were so “magnificent” that it had “the effect to make the two and three story buildings on the avenue look exceedingly small” (Cambridge Historical Commission, 1977, pg. 154). Indeed, the primary building was a five-story high brick structure measuring 250 by 85 feet. Three additional factories, likewise made out of brick, were built behind the main building. By 1896, the Henderson Brothers had the second largest carriage factory in the United States (Gilman, 1896; Stone, 1930). By the early twentieth century, the Henderson Brothers shifted their manufacturing focus in response to the growing popularity of the automobile (Stone, 2003; Gilman, 1896). Although Francis Robert Henderson reportedly believed that cars were only a fad and –allegedly, refused an offer by Henry Ford to convert the carriage works into an automobile factory – by 1912, the company was primarily involved in the production of truck bodies (Girard, 2010; Rettig, 1969; Riley, 1946). By 1914, the Henderson Brothers were well-established in the automobile industry, even as they continued selling Concord and Democrat carriages. Although the company employed thirty-five employees and had a capital of $100,000 as late as the 1920s, the Cambridge factory was ultimately shut down in the second quarter of the twentieth century (Stone, 1930; Cambridge Chronicle, 1983; Riley, 1946). By 1929, the factory was converted into a Ford automobile dealership and remained as such until its renovation in the early 1980s (Cambridge Chronicle, 1983).